Stylish design along with lots of detail makes these Action Sport Cheerleader Awards a great choice. The cheerleaders are shown with one pom pom at her hip and the other raised in the air so you can almost hear her yell "GO TEAM"! Great flexibility is provided with these awards as they are available in a choice of gold / bronze finish, as well as two heights 6" and 8". The stylish and elegant black base on these awards provide plenty of room for whatever your personalization needs may be. These awards will be perfect for your next cheer leading event. 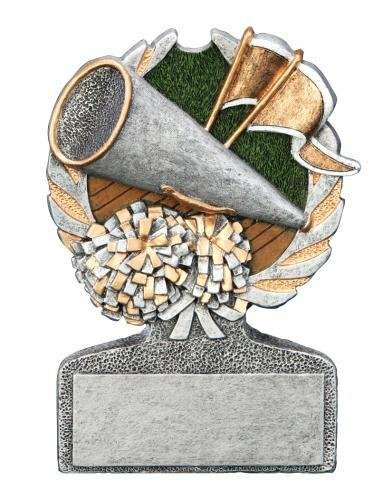 This cheerleader multi color sport resins gives you a colorful and unique award. The award showcases cheerleading icons of a megaphone, pom poms, and pennants. The full color version where gold and pewter highlights the pom poms, megaphone, and pennants set against a detailed wood color of a court and green background of a field that complete the look. A wreath with a bow at the bottom bring the entire award together. Standing 5" tall with plenty of room on the base for your engraving needs is sure to make this award something everyone will cheer about.